The RS4 takes its place among a long line of high performance Audis. Drastic changes in exterior design coupled with a four-wheel drive system and a more powerful engine combine to create one excellent automobile. On the outside the A4 can be identified by its Xenon headlamps and deep front bumper with air intakes on either side. The rear can be identified by the large bore exhaust pipes and discreet boot spoiler. The A4’s engine has been enhanced mechanically. The 4.2-litre V8 has been improved with the addition of direct injection and with custom-made internal parts to greatly increase the engines output. The cars hood and side wings are made from lightweight aluminium instead of steel. This helps to improve the car’s weight distribution and handling balance. The noted improvements combine making for a better overall driving experience. Inside the RS4 the stylish bucket seats adjust for maximum comfort and support. Inside, the cabin boasts many high-level standards, such as a Bose stereo system, climate control and sport mode, all activated by controls located on the steering column. The RS4 is a fairly expensive vehicle. Insurance runs high, and running costs won’t be cheap either. Even if you choose the more fuel efficient diesel engine. The front passengers have adequate head and legroom, while rear passengers also enjoy plenty of space. The boot is fairly large and can accommodate most reasonably packages. The controls in the cabin are excellent. They are clearly labeled and easy to find. They are all logically placed. The car’s Multi Media Interface system controls vehicle navigation and audio settings. The RS4 is excellent on comfort. The Dynamic Road Control System allows suspension coverage over the roughest terrain. The seats that come standard with the car are adjustable and very comfortable regardless of passenger size. Accessing the RS4 is not difficult at all. Heavily bolstered front seating compartments require a little more effort. The boot is quite accessible though with its wide aperture. The RS4 is a super easy car to park thanks to all the Audi Automotive equipment. It provides great front and rear vision, and comes equipped with both front and rear parking sensors. The car’s steering is light and blends right into the mix, and the end result is easy parking. The wheels are a little wide however and the driver should use caution when parallel parking. The RS4 is an expensive car that delivers driving excitement with a powerful engine that delivers low rev torque and high rev punch accompanied by an awesome V8 noise, how could it not be exciting. The braking system on the RS4 is excellent, suspension is good, and the grip is top-notch. The steering occasionally feels a little lacking, but over all the RS4 delivers a splendid ride. The RS4 would make a good family car too. It provides plenty of room for all of its passengers and could easily accommodate a family with smaller kids or a family with older children. The car offers plenty of boot space, and the RS4 has offers plenty in the way of passenger comfort even on long trips. The RS4 is not a practical first car. It is expensive to purchase and expensive to run. Even though it is an easy car to drive it offers too much power for a beginning driver, and insurance would be costly. This is a quality car. The RS4 makes use of quality materials inside and out and that is very obvious from the look and feel of the car. The RS4 sports and delivers a high performance image. The RS4 is going to attract a lot of attention and could easily catch a thief’s eye. That’s why it has been fitted with a Thatcham–approved alarm system. There are other optional security add-ons available, such as; double glazed windows, and tracking devices. The RS4 has been designed with safety in mind. The car comes equipped with the usual array of various airbags, ABS, ESP, Xenon headlights, a strong body shell, and other features that help to enhance the safety of the vehicle. The RS4 comes equipped with a Bose sound system. The system includes a CD player and tuner with ten speakers. The sound quality is great, and an automatic noise compensation system automatically adjusts the sound level according to the level of exterior noise. Most of the interior colors are comprised of dark greys and blacks, there are lighter options available. The cabin’s chrome and silver trim keeps the cabin from feeling too dark. The instrumentation and displays have red backlighting, and leather trim comes standard with the RS4. 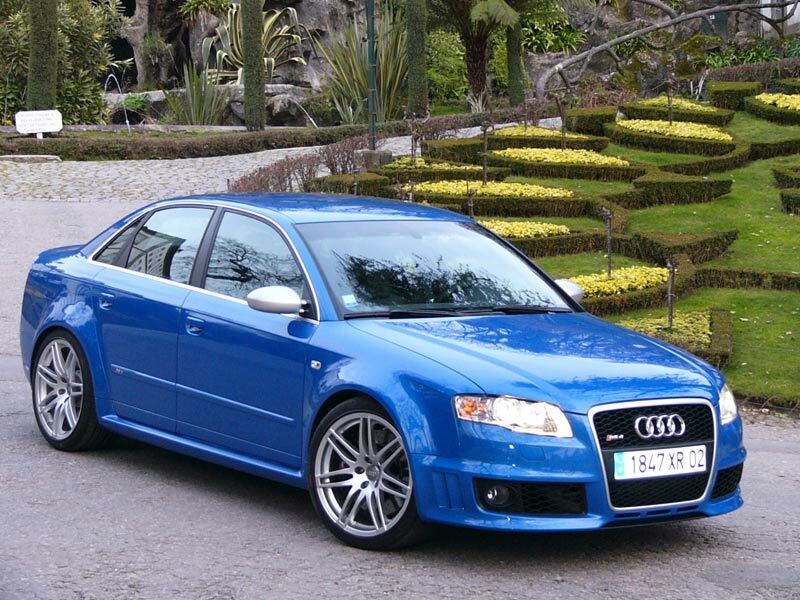 The RS4 comes with a high price tag, but that price is matched by the RS4’s amazing ability. It’s easy to drive, comfortable, and delivers an excellent performance when driven fast. The engine also performs well and the 4-wheel drive system comes in handy in all types of weather.